Xavier Antich et al. 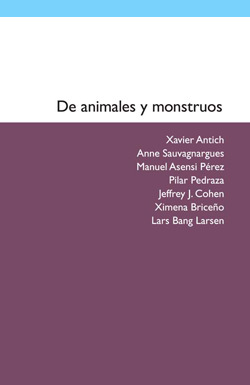 De animales y monstruos, edited by Juan de Sola Llovet. Barcelona: MACBA Editorial, 2012, pp. 2750 (translated by Marta Pino Moreno). ISBN: 978-84-92505-51-7. Spanish translation of an essay by Anne Sauvagnargues included in a book published by the Catalan museum of modern art Museu dArt Contemporani de Barcelona (MACBA).